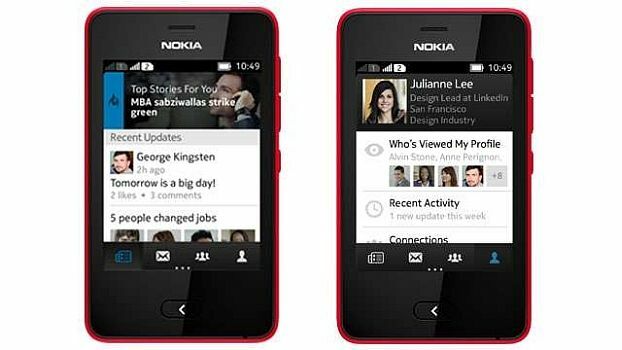 LinkedIn has launched a new app for the budget Nokia Asha full touch phones and the Asha 501 mobile phone. LinkedIn has launched a new app for Nokia Asha 501 and full touch users. The app allows you to connect with your professional network, get the latest updates, search jobs, etc. LinkedIn has grown at a rapid rate and has crossed 20 million members in India. The LinkedIn app supports six languages: Bahasa Indonesia, Bahasa Malaysia, Brazilian Portuguese, English, Russian and Spanish. Users can download the app from the Nokia store. Recently the focus on the budget mobile segment has grown considerably with major players like Nokia launching budget mobile phones. Nokia launched the Asha 501 for Rs. 5,300 in May. The Asha 501 mobile phone has a 3-inch LCD capacitive touchscreen and offers Dual Standby SIM (GSM GSM) support. It has expandable storage capacity of 32 GB, a 3.2 MP primary camera with video recording and is Wi-Fi enabled. It has a 1200 mAh battery that delivers 17 hrs (2G) talktime and 624 hrs (2G) standby time. Foursquare and Here Maps have also launched new applications for the Nokia Asha 501. The apps target low end devices that do not support GPS connectivity.